Friends Provident International announces today it is supporting the 2011 Commonwealth Youth Games, in a £20,000 sponsorship deal. The games, which will take place from 7 to 13 September 2011, will be one of the biggest events ever to take place on the Island. “We are delighted to be able to give our backing to the Games. Friends Provident International has operations around the world, and serves a truly global customer base, with many of our customers living and working in Commonwealth countries. We believe that the games will play a major role in raising the Island’s international profile, and we are only too happy to play our part in what I’m sure will be a milestone event. Hosting the games is a huge accolade for the Island, and will go a long way to helping it take its place on the world stage”. Friends Provident International will be a Partner Sponsor for the Games, one of ten such sponsors, and the announcement of its involvement is the latest boost to the momentum of the event, which will bring over 1,000 competitors, 600 officials, plus the world’s media, to the Island in 2011. 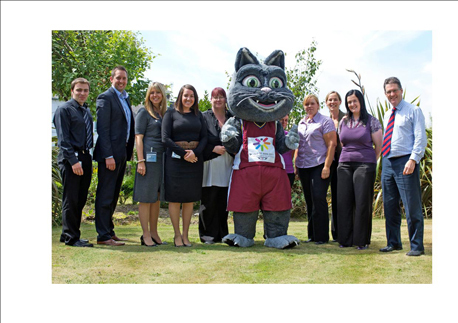 Commonwealth Youth Games 2011 mascot Tosha visited Friends Provident International to meet staff at the company’s office in Castletown. Friends Provident International is one of the ten Partner organisations sponsoring the Games and has set up a committee to promote the company’s support for the event and encourage volunteers to sign up to help out when the games begin in September next year. As a sponsor of the Games, Friends Provident International, which also has offices in Hong Kong and Singapore, has been assigned to support the Asia team and help with any requirements that arise during the competition. The Commonwealth Youth Games will be held from September 7 to 13, 2011. Over the next year around 1,500 volunteers with a variety of skills and experience will be recruited to assist throughout the games in a number of roles. Pictured above with Tosha, left to right, are Alastair Shaw, FPI CYG committee member, Andy Booth, of Barclays Wealth (Sponsors’ Liaison for the Commonwealth Youth Games 2011), Victoria Karran, volunteer co-ordinator for CYG 2011, Emma Ledsham, Caroline James, Leanne Broadhurst, Natalie Bush and Vicky Harding, all FPI CYG committee members, Lizzie Kinvig, chairperson of the FPI CYG Committee, and Jonathan Hall, general manager and director at Friends Provident International. Ashley Cowin who is also on the FPI CYG committee was also in attendance.